Last week-end, I received Espressif Audio Mic HDK, an ESP32 board with a 3-microphone array which I’ll review a in a few weeks once documentation becomes available and I clear some other items in my review list. In the meantime, I checked out the hardware, and found out the mainboard also comes with Microsemi ZL38063 audio processor specifically designed for microphone array. 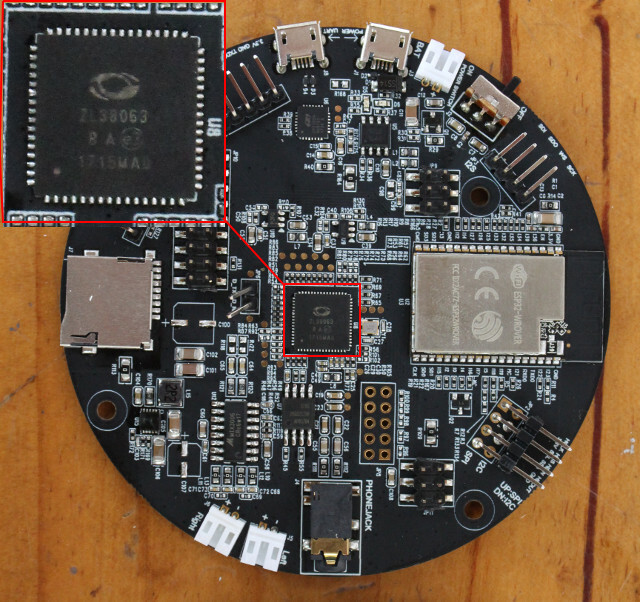 The chip was released las year, and can be already found in the company’s AcuEdge Development Kit for Amazon AVS, but since I’m going to use a board based on ZL38063 I’d thought to have a closer look to better understand its capabilities. ZL38063 is a great chip, too bad it costs over $10. Ouch! that’s really quite expensive for a DSP. Can’t see a lot of companies implementing it in their products at that price, even though it comes with a ready made firmware and some software. i got this LyraTD too, but nothing more at this time. so searching for DSP Datasheet and so on was not really successful. did you ever get a response from Microsemi Webside? and after this now i am waiting now 3 weeks for release note of web login. please let me know . without them – LyraTD is not useable, this is the problem of Microsemi support and response time, now CNY comes and then is again 3 weeks pause. Thank you for logging into your Web Profile account. You will need additional permissions to access this secured document. Please click here to request access. I’ve just requested access, and they’ve asked me to wait one or two more days. I doubt I’ll get it. You’d need to request it with a company email address. Damn, I’ve just noticed that if you want to download the software/firmware, you need a separate SDS Log In (SDS = Software Delivery Server). Registration is automatic, but then you need to request for each software package, and again they ask you to wait for a couple of days. we talked this just in time cause RISC V.
but the documentation is one of the most closed!